I am aware that these little bastards are generally harmless but wtf are they doing in my house? They are supposed to like dark, damp places ... my bedroom is anything but damp and dark. Remember ... I have an entire wall of window through with the fire of Hades warms my room to the temperature of the sun. To get rid of them you're supposed to seal cracks in the walls. Well we sure do have our fair share of cracked walls (and doorframes) ... Not to mention windows with a layer of sand on the sills because they don't seal, a door with a gap that allows moisture into the entryway, and water damage on one of our ceilings ... I think I've figured out how they are getting in! Seriously, I don't care how many spiders they eat ... in my house, they die! I too hate the little suckers! I crush them when I see them. I moved some fencing the other day and they were everywhere! YUCK! Oh my gosh, I had a centipede problem in our house for about three years. We live in an old Victorian place with lots of spaces in the windows, spaces between floorboards in the corners, etc...it is actually a very nice place, but very old. We have FINALLY managed to get rid of the cenitpedes by doing the following. (1) had a pest company come spray the outside around the foundation, (2) cleared ALL of the weeds, debris, leaves from the outside of our house so the foundation could really dry out, (3) sprinkled BORAX around the perimeters of the rooms, and (4) kicked out a roommate of ours who was ALWAYS doing laundry, and therefore greatly increasing the humidity of our house! Now our house is much drier and cleaner. 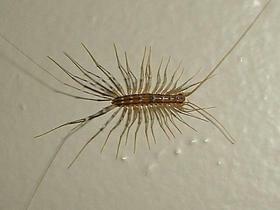 I used to see at least two centipedes EVERY NIGHT, either in the kitchen, bathroom or my bedroom (ugh! ), but now I have seen just ONE in three weeks! I consider that to be excellent progress! OH yes, I also bought one of those electronic pulse repeller things for each room downstairs, don't know if it's really helping or not...but I am sure going to keep it plugged in! :) I am SO HAPPY to finally be RID of those awful things...they gave me nightmares!!! well I hate centipedes and well I havn't tried anything yet but just the other night I found one in my frige. I sreamed and mad my boyfriend get rid of it I see about 2 a night...what should I do? I found one in my mom's bedroom while I was playing on the computer and it scared me soooooooooooooooooooooooooooooooooooooooooooooooooo bad that I screamed and jumped on her bed! !We are trying to figure out how to get rid of them before they take over our house! !My mama has seen them 2 times now and she has seen them about 3 weeks each time! !How do we get rid of them?We will try anything! !But,at least they eat pests but they still seem that they will cause a harmful bite! !We are trying everything! !